Elysian Dragonstooth Stout Ice Cream - Thanks to alirjd on Flickr for the photo. If you aren’t aware, there is an ice cream craze going on in Seattle. No less than 3 new local ice cream shops have opened up within a 3-block radius of each other in Capitol Hill this year, and the newest on the scene is Bluebird Homemade Ice Cream & Tea Room. What does this have to do with beer? Well, one of their signature flavors is made with Elysian Dragonstooth Stout (they are located on the same block). We tried it last night, and it is indeed a scoop of malty goodness. If I didn’t know it was a beer ice cream, I would have just guessed it was a “malt” ice cream; similar to a malted milk shake. While I really enjoyed the stout ice cream, our favorites were the peanut butter and the snickerdoodle flavors; the peanut butter combined with the stout was quite the combo. In other non-ice cream news, the Fremont Brewing Universale Pale Ale is starting to hit some taps around town. It sounds like it is on already at the Park Pub, Naked City and the Dray, and it will be on soon at Duck Island as well. Congrats to the team at Fremont Brewing for getting beer out to their first accounts! Our Lively Assistant Brewer Jim Parker has planned a Northern Washington Summer Beer Bus Tour with Chuckanut Brewery! Jim Parker and Skip Madsen (Washington Brewer) and long time friends, will be reuniting as hosts to the Northern Washington Summer Beer Bus Tour…they also guarantee that it will be more fun than you should ever be allowed to have! The Beer Bus will leave from Brouwer’s Café (400 North 35th St) in Seattle, WA with an alternate North side pick-up/drop-off spot at Balefire Beer & Wine Bar in Everett, WA. The Bus Trip will leave on Saturday, August 8th at 10 a.m. traveling North to visit four Northern Washington Breweries: Chuckanut Brewery (Bellingham), Boundary Bay (Bellingham), Anacortes Brewery (Anacortes), Skagit River Brewery (Mt. Vernon). The Beer Bus Tour will have our tasty Chuckanut Beer on tap on the bus, and of course…bathrooms! We will host a Barbeque lunch at Chuckanut Brewery of Local Hempler Brats with house sauerkraut, Local Misty Isle Cheese burgers, and Garden Burgers all served with Tim’s Potato chips. Bus, Chuckanut Bus Beer, and BBQ are all included in the price of admission. The Beer Bus will return to Brouwer’s Café at 7pm. Spots are filling up fast, so get signed up now! Advance Registration is required by Saturday, August 1st and ticket price is $50 dollars. You obviously must be 21 and older and contacting Jim Parker at Chuckanut Brewer jim.parker@chuckanutbreweryandkitchen.com or 360-752-3377 for purchasing tickets is the best way to get signed up…so get on board! 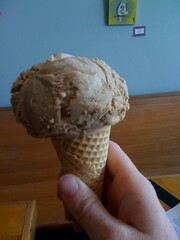 The Lark on First Hill has the best MALT ice cream ever. Mmm, that ice cream sounds delicious! I think the bus tour will be a great time….but I’ll be out seeing Phish at the Gorge!